A diode consists of a two-terminal electronic device allowing current to flow with little resistance in one direction, yet simultaneously applying a high resistance in the reverse direction. An electrical check valve : current goes through one way, but won’t go back. Although the physical appearance of a diode may appear deceptively simple, the diode lends itself to a multi industrial world with literally billions of electrical and electronic applications. The diode’s main function for charging systems in the automotive market is of course rectification. It is how the alternator which produces alternating current (AC) changes it to DC (direct current) so the power can be effectively stored in a battery for later use and consumption. We all know the battery and the alternator are the most popular main power source for any mobile vehicle on the planet. The diodes are generally located on a rectifier, but every rule has its exceptions. 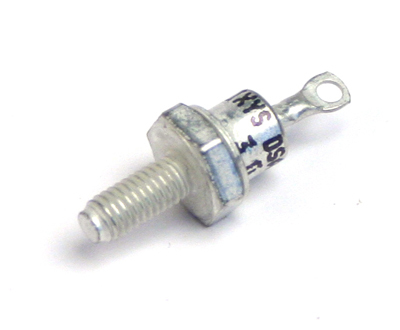 Certain specialized diodes have many other uses in the automotive market. Zener diodes are used for their ability to stabilize a voltage, or control it at a certain point. 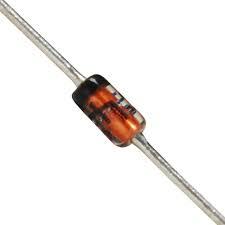 This quality makes the zener diode a valuable commodity for integrated circuits that operate at a specified voltage. The zener diode is a main component in alternator voltage regulators. Another type of specialized diode is the avalanche diode. The avalanche gets its name by observing the voltage graph of a slowly rising voltage applied the the diode. It will slowly rise to the set point, then suddenly cut off and shut down the current. This makes the avalanche diode valuable to design engineers as a fail safe to prevent runaway voltages due to outside failures. Diodes are extremely useful when curbing transient voltage spikes as clamping devices. Constantly, over the entire vehicle, there are constant power surges from charging and collapsing coils. Each time a current is delivered, there is a reciprocating back surge known as counter EMF (electromotive force). This can be damaging or even fatal to sensitive on board computer systems or other electronic components. Diodes can be placed into the system to sync all the transients or “clean up all the dirt” in a particular area of problem. Older Delco (GM) alternators are equipped with what was infamously known as the diode trio. The diode trio was in millions of GM alternators. They called it the “SI” series. The triodes acted as an electrical one way check valve that allowed current to flow in only one direction. The diode trio is designed to provide current for the field circuit for the brushes and rotor, thereby turning off the charge indicator light when the trio voltage is equal to, or greater than the battery voltage. 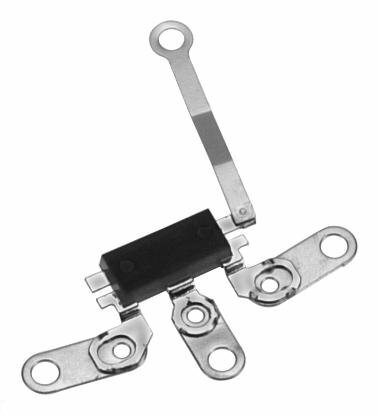 Many other internal regulator designs also incorporated the diode trio.